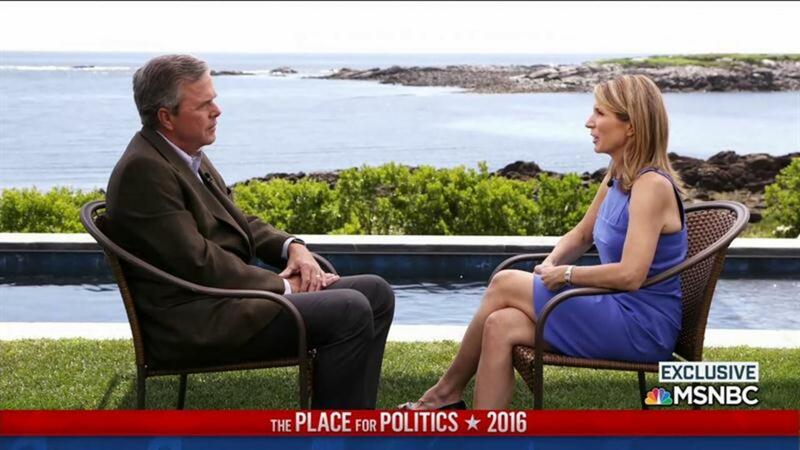 Former Florida governor and failed GOP presidential candidate Jeb Bush told MSNBC's Nicole Wallace that he won't vote for Donald Trump or Hillary Clinton because the candidates don't "pass the threshold" to be president. "I feel like your decision to not vote leaves me without a Northern light. How did you arrive at the decision not to vote?" asked Wallace, who is a former GOP strategist with ties to the Bush family. "The simple fact is there's a threshold past which anybody who steps in the Oval Office must go past. And I don't think either Hillary Clinton or Donald Trump go past that threshold," Bush said. "If you believe like I do that the presidency is sacred ground and you want a president who upholds the Constitution, and I don't think either of the candidates fulfill that primary kind of objective, then I can't vote for either one of them," Bush said. Bush also predicted that Trump supporters will "feel betrayed" when his promises aren't fulfilled. However, Bush did have one positive thing to say about Trump. "He's a master at understanding how the media works – more than anybody I've ever seen in politics. Kudos to him, for kind of creating the environment and then manipulating the environment to his effect," Bush told Wallace.